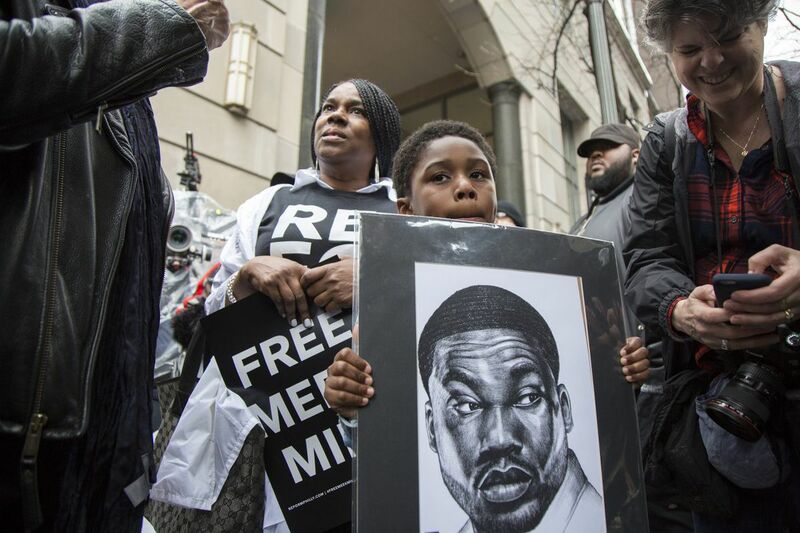 Meek Mill’s son, Rihmeek Williams, and his mother, Kathy Williams (background to left), at a rally and sit-in last week. After five years on probation stemming from 2013 drug charges, Jose Pacheco has been referred to almost every treatment program Philadelphia has to offer — and he's done nine stints in county jail for technical probation violations, most recently for arriving "incredibly late" for court. Each time he violated, an order known as a detainer would be lodged against him by a probation officer. That meant he'd be locked up indefinitely, without bail, until a judge released him, usually three or four months later. On Monday, his probation officer, Craig Baumbach, showed up in Courtroom 505 to argue Pacheco's probation should be terminated. With Krasner as DA, is Philly finally ready to end cash bail? "I don't think what's going on necessarily warrants jail time," Baumbach told Judge Frank Palumbo. "He's a young man who can't beat his addiction. Personally, I think the more time he spends in jail on State Road, the more he is going to be in front of your honor for years to come." Palumbo disagreed. "The problem I face here," he said, "is I need leverage to hold over his head." The result of this cycle — repeating in courtrooms across the city and the state — is that Pennsylvania now has the highest rate of citizens under probation or parole supervision in the Northeastern United States, and the third-highest rate in the country, behind Georgia and Idaho, according to an analysis from Columbia University Justice Lab released Wednesday. That's 296,000 people under supervision statewide, and one in 22 adults in Philadelphia. People locked up on violations of parole or probation account for one-third of state prison inmates and more than half of the county jail population. "These numbers are not defensible," said Vincent Schiraldi, the report's author, a Columbia research scientist and a former commissioner of New York City's Probation Department. "They cost you enormous amounts of money. They're not good policy. And they're causing enormous deprivations of liberty that I would assume are making the system seem illegitimate in the eyes of a section of the population — particularly, I suspect, young black men." In Philadelphia, 44,000 people are on probation. The most famous among them is, of course, the rapper Meek Mill, who was sentenced to two to four years in prison for probation violations related to a 10-year-old drug and gun case. Tuesday, the state Supreme Court ordered him released on bail. Although city leaders have reduced the jail population 32 percent since July 2015 — and District Attorney Larry Krasner ordered his staff to seek shorter probation terms when he came into office — the number of people on detainers for probation or parole in Philadelphia jails has fallen at a slower rate, down 21 percent as of March to 3,000, according to Julie Wertheimer, of the city's criminal justice office. In a memo to court leadership, the chief of Philadelphia's Defender Association, Keir Bradford-Grey, made public by WHYY in March, called the current detainer process illegal. She said no one should be detained without judicial approval. At a recent community meeting, she said that city and court leaders are exploring potential reforms: "There's still a presumption of innocence here. So for people to sit in jail for lengthy periods of time awaiting their trials, that's not justice." Why so many people are under supervision in the first place — the parole rate, the highest of any state, is three times the national average — has a lot to do with Pennsylvania's unusually harsh sentencing laws. As Krasner said Monday, during his budget address to City Council, long sentences "put so many hurdles in front of [people], they cannot help but trip." The result is, on any given day, Philadelphia criminal dockets may contain a hundred or so probation-violation listings. In the city's primary violation-of-probation courtroom, Palumbo handles about 60 such hearings in a day. About three-quarters of them are conducted via videoconference from the county jails, each probationer a forlorn figure in a blue prison uniform heard through a tinny speaker. The rest are permitted to walk in off the street. The city did not respond to requests for data on how many people currently in jail on detainers committed technical violations (like failing a drug test or missing a reporting date), as opposed to being charged with a new crime. Technical violators made up a significant number of those coming through Courtroom 505. One man, Bryant Dickenson, spent two weeks at the Detention Center for "absconding," or failing to report to his probation officer. He was homeless at the time. Palumbo quickly permitted his release. Others were charged with new crimes. For them, Palumbo suggested in the courtroom, detainers are useful in that they pressure defendants to take deals. "Even though you're presuming innocence, if [you're in on a detainer], you're either going to have to wait or you're going to take an offer." He added: "If all the detainers get lifted, these cases won't be resolved because people would fight [their cases] from the street." In a case like Pacheco's, probation also functions as leverage, but for a different end. Baumbach, the probation officer, said Pacheco had struggled with drug use — Percocet, Xanax, marijuana. He recently nodded off while holding a lit cigarette. A 23-year-old man with a neck tattoo and a 3-year-old son, Pacheco said he wanted to get into treatment. "If you give me a chance, I can do this. I'm tired of going to jail," he told the judge, who warned him if he failed, a "long chill-out time" in state prison would be the next step. The judge expressed irritation with the Krasner administration's requests for less probation. "You need an adversarial system," he told the prosecutor on duty. "I'm not going to have your office lose its leverage." A probation reform bill introduced by State Sen. Anthony Williams in March would erode some of that leverage by limiting probation periods and banning back-to-back prison and probation terms. However, it has not yet advanced in Harrisburg. For now, advocates like ACLU policy counsel Nyssa Taylor are urging the court to simply follow its own rules, and ensure that any detainers are lodged by judges, not probation officers. Schiraldi said the state should go further, and rethink its use of probation and parole altogether. "You need to treat probation and parole like they're finite resources," he said. "There's no way they can supervise 296,000 people. That is too big to succeed." He pointed out that most recidivism occurs within a couple of years of release from prison. "Anything after two years, you get diminishing returns," he said. "That's what you're getting in Pennsylvania today: worse supervision for people who need it the most." On Monday, a few individuals learned their probation had been terminated. They looked shell-shocked, after so many years under the thumb of the system. They actually wept with joy. One was Cymenda Chambers, a 45-year-old phlebotomist who had spent 13 years on probation. "That was because I kept messing up," she said. "I kept running, because I knew I'd have dirty urine. But I was tired of going to jail. I was like, I've got to get myself together." She had been a cocaine user, but she's been clean a year and a half. "I feel so great!" she said. "It's over. I'm a free agent now."